RIO DE JANEIRO, Aug 7 2017 (IPS) - Brazilians now have new reasons to yearn for and at the same time fear the parliamentary system of government. It facilitates quick solutions to political crises such as the one that is currently affecting the country, but it also further empowers reactionary forces and has led to backsliding on gains such as indigenous rights. In a country with a presidential system of government, the “semi-parliamentarism” which many people, including President Michel Temer, identify in the current administration, is working against indigenous people and other sectors that have little say in parliament. 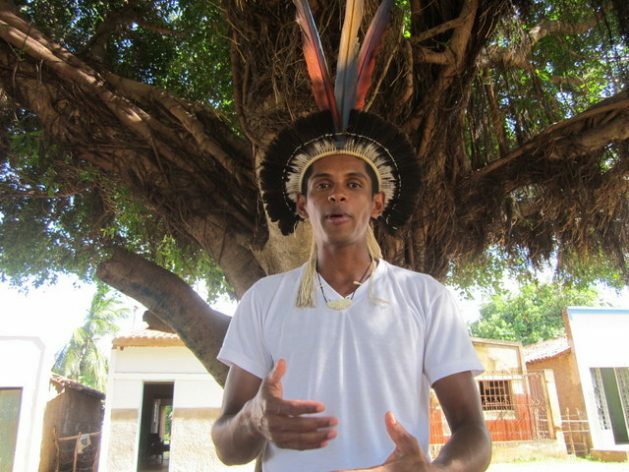 “The national Congress forms part of a conservative system, a ‘democracy’ which never took indigenous representation into account,” lamented Marcos Terena, coordinator of the World Indigenous Nations Games, also known as the Indigenous Olympics, and a veteran activist of the Terena people, who live in west-central Brazil. Native people are suffering an offensive against their rights, which has intensified since Temer took office. Temer, who went from vice-president to president in May 2016 after the impeachment and removal of Dilma Rousseff, who was elected in 2014 and accused of fiscal fraud, totally depends on mainly conservative parliamentary groups. This dependence started with how he rose to power, because a two-thirds majority in both houses was required to remove Rousseff. But it has been heightened since May 17, when the scandal broke out that made Temer the country’s first sitting head of state to be formally charged with a crime. A conversation recorded by Joseley Batista, owner of JBS, the world’s largest meat processing company, was the basis for a formal accusation of corruption against Temer by the federal prosecution office. On Aug. 2, the lower house of Congress rejected a corruption charge against Temer for alleged bribe-taking, which saved him from a possible Supreme Court trial might have removed him from office. But the federal prosecution office is preparing new charges of obstruction of justice and activity in a criminal organization, drawing out the parliamentary and judicial battle for the current presidency, which ends on Jan. 1, 2019. To ensure the backing of the ruralist parliamentary group, which according to their website has 214 representatives and 24 senators – 40 per cent of parliament – Temer is granting its members a number of benefits and the approval of legal measures, to the detriment of native peoples, the environment and fiscal austerity. Headed by large landowners, cattle ranchers and producers of grains for export markets, this bloc sees indigenous lands, whose demarcation is ensured by the 1988 constitution, as an obstacle to the expansion of agriculture. According to the last census, there were 896,917 indigenous people in Brazil in 2010, or 0.47 per cent of the population of 190.7 million at the time. But they occupy more than 13 per cent of the national territory, which the powerful ruralist caucus considers excessive. A constitutional amendment that would submit the demarcation of indigenous lands to approval by Congress is one of the ruralist bloc’s proposals, which would likely prevent the creation of new protected areas to ensure the physical and cultural survival of native peoples. Submitted in the year 2000, the initiative has been shelved until now. “I think that even the ruralists themselves recognise that the conditions for it to be passed do not exist,” said Marcio Santilli, founder of the Socio-environmental Institute (ISA), the non-governmental organisation that has the largest database on indigenous people in the country. A constitutional amendment requires approval by a two-thirds majority in both houses of parliament, which has become more difficult to obtain with a governing coalition weakened by accusations of corruption, not only against Temer, but also against his chief ministers and parliamentary leaders. “The biggest threat, more than a risk, is the time frame, a concept with which they want to limit the entire public administration,” on the indigenous issue, Santilli told IPS. This time frame is October 1988, when the constitution was approved. 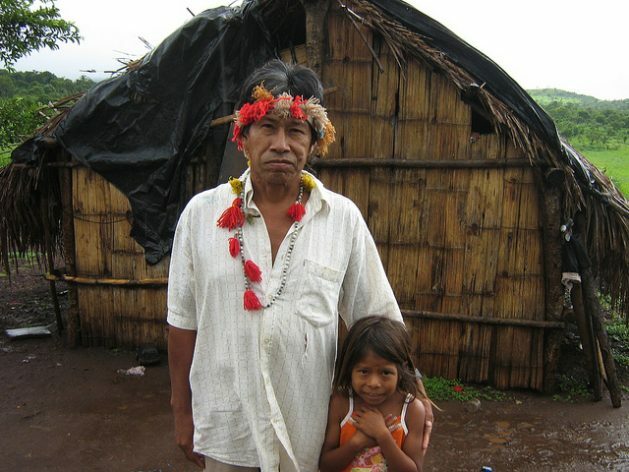 The rights of indigenous peoples were to be limited to the area occupied at that time, according to an interpretation by the Supreme Court, when it ruled in 2009 on the demarcation of the Raposa Sierra do Sol indigenous reserve, in the state of Roraima, in the far north of Brazil. The ruralist caucus wants this to be the general criteria followed. Up to now what have been demarcated are “lands traditionally occupied” by indigenous people, as stated in the constitution. Anthropological studies are carried out identify the territory to be demarcated, in a process carried out by the National Indigenous Foundation (Funai), which answers to the executive branch. The Attorney General’s office, which advises the executive branch, pronounced itself in favour of the validity of the time framework, “extending the threat” to prevent new demarcations, said Santilli, who presided Funai in the 1990s. According to data from ISA, Brazil has 480 indigenous lands already approved, but there are still 72 declared and 44 identified which are still pending demarcation, in addition to other 108 in process of identification, the initial phase of the process. There is a huge lag, because the constitution established that all the areas were to be demarcated within a five-year period – in other words, by 1993. A time frame makes no sense in “a country that was 100 per cent indigenous” when, in 1500, “the native people encountered the unknown world of the ‘coloniser’ which caused the extermination of thousands of natives and their communities, generating a national debt which cannot be subject to a moratorium,” Terena told IPS. Besides, the offensive against indigenous rights and lands has brought violent conflicts. 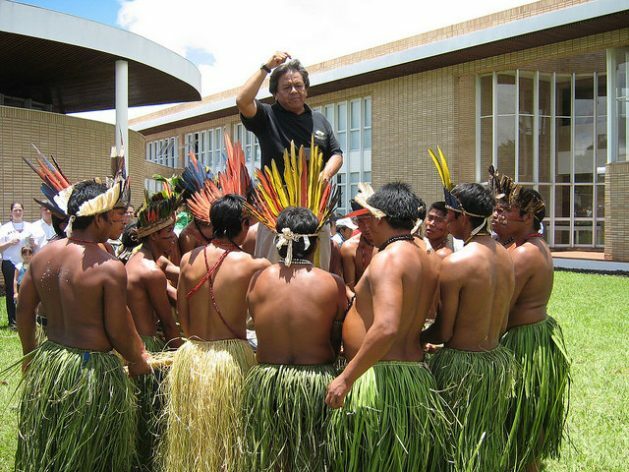 From 2003 to 2015, 891 indigenous people were murdered in Brazil, an annual average of 68, according to the latest report by the Catholic Indigenous Missionary Council. The violence has intensified in recent years, with 137 murders in 2014 and 138 in 2015. The current context encourages “anti-indigenous groups to promote proposals that range from changes to the sacred national constitution to attempts to block a budget capable of addressing indigenous demands,” Terena asserted. Another ruralist threat is to close down Funai, the government body which implements indigenous policies and has suffered constant budget cuts that curtail its functions, such as the anthropological studies and the defence of demarcated territories. The loosening of measures against mining and the construction of roads, hydroelectric plants and power transmission lines on indigenous lands are other means of pressure exercised by the ruralists and by companies that seek to “break down or weaken” indigenous peoples’ exclusive rights to use their lands, said Santilli. “There is an ‘anything goes’ mentality, against an absurd backdrop of weakness of the president, accused of corruption and with only five per cent approval in opinion polls,” who is incapable of defending the diluted rights of the minorities and the environment against the private interests of legislators, he lamented. The ruralist caucus reflects a distortions in parliamentary representation. Landowners make up a small sector of the population with disproportionate political power, in contrast to the millions of small-scale farmers, who are practically absent in Congress. The economical clout of the former and the electoral rules, which assign a larger proportion of legislators to small states in Brazil’s hinterland with rural economies than to the most urbanised states, go a long way to explaining the power of the conservatives, said Santilli. Weakened, Temer is distributing “prizes, incentives, public posts and advantages, paying the price for being saved, but when the money is finished, there will be an exodus,” predicted Antonio Queiroz, head of the Inter-Union Department of Parliamentary Advisory, which supplements the legislative work in Brasilia.